Pruning cuts-how to get them right! Part 1. It’s the time of year we all start pruning the dormant summer and autumn flowering shrubs and trees and getting the pruning cuts can be crucial for some plants for so many reasons. First of all you have to remember that you are being a surgeon on the plant and you would hate to have someone cutting you up with a blunt tool so make sure the tool you are using is not only sharp (will be featuring a bit of sharpening soon) but clean as well, if in doubt, just spray it with so household cleaning product that kills 99.9% of all know germs dead! You know the one I mean. Now one thing to remember is that all plants don’t heal themselves but work to reduce the damaged area to stop fungi and other diseases entering the plant. The plant first of chemical process that reduces the risk of the wound becoming infected and then it callus over in time using callus cell in the stems of the plant. This all depends on the type of shrub or tree you are pruning. Some plants can have very thin bark with a thinner layer of callus cells that can mean the cut takes much longer to heal, roses and beech trees are good examples of this. There is a difference on age of the wood too, the younger twiggy wood doesn’t heal at the wound but near the next available bud. Again that something worth remembering for in a bit. For this next bit, I am focusing on using secateurs and loppers and will do a bit of using saws later. First thing to look for is whether the buds are opposite each other or alternate (see pictures) this does change the angle of the cut. With plants that buds are opposite, its best to cut level just top of the buds so basically you don’t damage them. The plant will boast either one or both these buds into life in the spring. Now with alternate buds, you are looking at taking a sloping cut away just above the bud and angled so the bud is at the top of the slope. Some people think that you do that to allow the water to drain away but that’s not the main reason why, it’s done like that so the plant pushes the sap into that bud and allows that bud to break. The cut should be ideally no more than 10mm above the bud as any more above it can result in die back and the stem dying back past that next bud and down to the next, leaving more dead wood in the plant to attract in diseases. One thing to remember though, no one can get it right all the time, not even us professionals, the idea is to aim to get it right most times and try and achieve at least 80% good cuts. Hopefully the pictures below will explain a bit more. 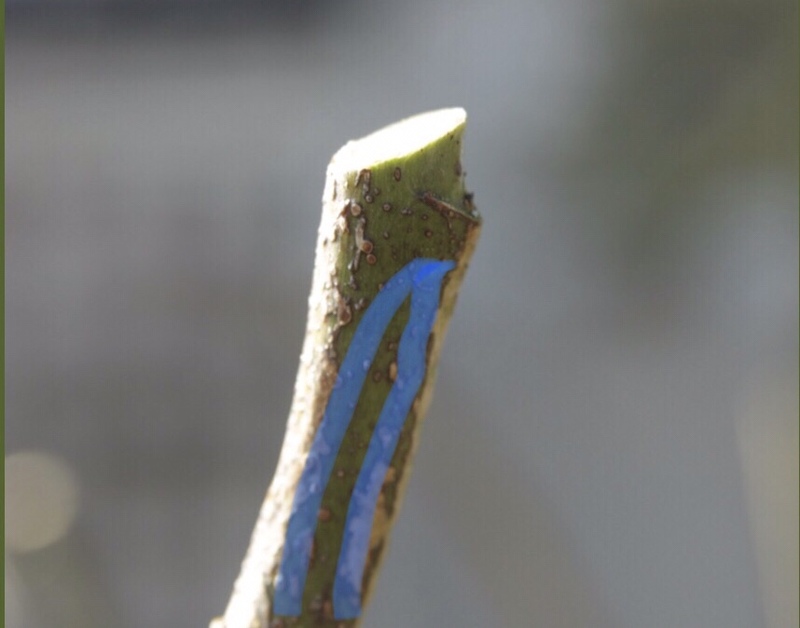 The alternate bud cut at the right angle with the blue lines showing what is happening to the sap and how it pushes it towards the bud to encourage that one to break. Well that’s the end of the first part, next time we shall look at using a pruning saw and how to make the bigger cuts with that.